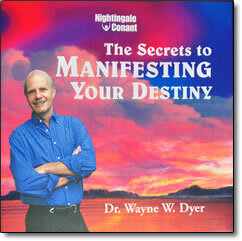 The Secrets to Manifesting Your Destiny – CDs by Wayne Dyer – Discount! Learn how to manifest your own destiny. Can you imagine being able to manifest everything you want in life? You can make problems go away and bring every joy and reward your heart desires into your life. What most of us are taught to believe about reality conflicts with this idea. And yet everyone has this ability within himself or herself. Think about it. You accomplish in life those things that you truly believe you are capable of doing; what you focus on and have no doubts about really does come to pass; your life is shaped by the things you spend the most time thinking about. By practicing the techniques and meditations revealed in this program, you will have the power to make the impossible a reality. Wayne Dyer has always been known as a speaker and writer with great passion, humor, and wisdom. One of the great teachers of our time, he has the ability to take profound subjects and make them profoundly simple. In this live seminar, he uses his talents to reveal to you ancient spiritual teachings that will uplift your spirit and change the way you think about life forever. Using nine simple principles anyone can understand and practice, he helps you discover extraordinary powers you never imagined you possessed. The capacity to manifest is more than a power within you. It is the power of life itself. And in this program you will be taught how to overcome your conditioning and grant yourself the power to know that manifesting your desires is possible. Included in this groundbreaking audio program, there’s an amazing ancient 20-minute technique that will enable you to create anything you want in life, whether it’s love, money, improved health, a better job, or anything else you want or need.